Hello friends! I must apologise for my lack of posts recently, the last couple of weeks have been a bit of a whirlwind - so I will do my best to fill you in, and hopefully you can forgive me for slacking off! Last Monday I came down with some pretty crazy stomach pain. I have IBS/digestive problems so I figured I must've accidentally eaten something that didn't agree with me and triggered some kind of reaction, but within about an hour and a half I was so unwell that I couldn't move and Sam decided to take me to the hospital, and it's a really good thing he did, or else I could've ended up in a lot of trouble. After a couple of hours in the emergency room, the doctor (who was very kind and reminded me a lot of David Tennant as, yes, The Doctor) told me that I had appendicitis, and within another couple of hours I was speaking to a surgeon, admitted to the hospital, and taken to a surgical ward. It was crazy how quickly everything happened, it's been a week and I'm still trying to register what happened! To cut a long story short, I had an operation to remove my appendix on Tuesday afternoon. I was then sent home on Wednesday and I've been doing my best to get up and around ever since. I've been really lucky and I've received a lot of support from my parents, and Sam's been incredible. I'm not allowed to drive for another week, so I need all the help I can get because getting around with holes in your belly sure is difficult! Anyway, while I was at home in bed I was able to take advantage of Lime Crime's black friday sale, hooray! 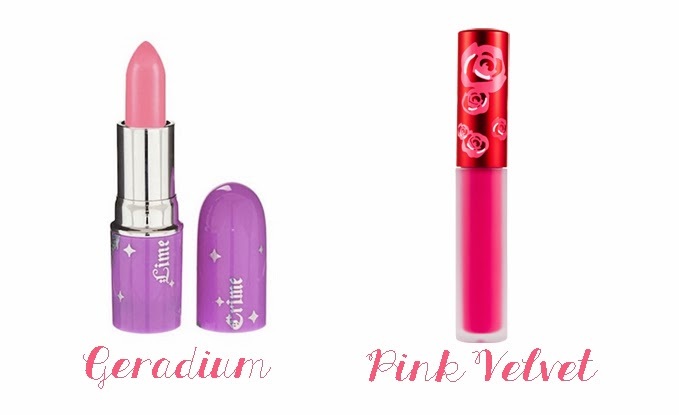 After months of lusting, I finally bought a tube of Geradium opaque lipstick, and I also snapped up the long awaited Pink Velvet Velvetine lipstick. So expect reviews of these bad boys in the coming weeks! I'm also on the hunt for some cute blogs to check out, so if you like to blog about fashion, makeup, food, or just things that are nice, leave a comment with your blogs URL so that I can have a read while I'm resting up, I'd appreciate it lots!